This week I came down with Three-Day Killer Death Flu. I also had a high-pressure deadline at work, so my cats didn’t get as much attention as they’re used to. Fortunately, instead of complaining, they decided to help out around the house. I woke up yesterday morning to find that the cats were cleaning their toys. They may be messy eaters, but at least they wash their own toys. I took that picture on my phone and posted it to Facebook. As I was typing the caption, my cat Seffie came into the kitchen. By the time I’d finished typing (I’m a slow phone typist), she’d had taken the toy out of the bowl and was playing with it. Apparently it had been soaking long enough. Apparently the blue toy needed washing again. The blue toy may not be obvious in that photo, but you can see it in this close-up. I wonder what I’ll find in the kitchen tomorrow. Update: I’ve started a Things I Found In My Cat’s Water Bowl tumblr. Ever since I heard about Tilda Swinton’s performance art piece “The Maybe”, which involves her sleeping in a glass box “on top of a mattress, with just her glasses and a carafe of water” at the Museum of Modern Art in New York, I’ve been wondering: why does she need her glasses? She’s just going to sleep, and maybe drink some water. She’s not even going to pour the water into a glass. She doesn’t have a book or a wristwatch, so she won’t be reading or checking the time. It’s possible that she’ll need her glasses when she leaves the box, but if that’s the reason, why doesn’t she also have keys, money, credit cards, and/or a phone? Instead of Tilda Swinton sleeping in the box, it will be me. My cats will also be in the box. Unless they get bored, in which case they’ll need to be let out of the box, and then let in again when and if they want to return. It would probably be easiest just to install a cat door on the box. I’ll also need a couple cat wranglers to keep an eye on the cats and make sure they don’t leave the museum. I can’t just lie down and fall asleep. I need to read for a while. I’ll need my Kindle in the box. Seffie won’t let me go to sleep unless I play with her with the laser pointer first. So I’ll also need a laser pointer. I realize this isn’t ideal, but it’s unavoidable. I usually run the dishwasher right before going to bed. I’ll need to hear dishwasher sounds each day until I fall asleep. If installing a dishwasher on the museum floor turns out to be impractical, I might be able to get by with recorded dishwasher sounds, as long as they’re realistic enough and MOMA sends someone to my house to wash my dishes. Instead of a carafe of water (which I assume is an open container, although I can’t find any pictures of Ms. Swinton’s carafe), I’ll need a bottle that closes; I’m concerned that if I have an open carafe in a small space, I might roll over in my sleep and spill it. Also my cats would probably drink out of it. You’ll notice I’m not insisting on a glass. I’m willing to rough it for the sake of my art. I’ll need my cell phone. I’m not planning on making any calls, but I can use it to check the time or tweet about any unusual dreams I might have. Also, I plan to use it as an alarm clock. I don’t want to oversleep and get locked into the museum overnight. And I hate to sound overly mercenary, but if I’m being paid to sleep for seven hours, I don’t see why I should spend any extra time sleeping for free. Some of these requests will take a bit of work on MOMA’s part, but I’m sure they can accommodate me. At least I’m not demanding to have my glasses in the box with me. That would be unreasonable. So the obvious choice was Purrsephone. But that’s too many syllables (and maybe a little too cutesy for everyday use), so I’m calling her Seffie. 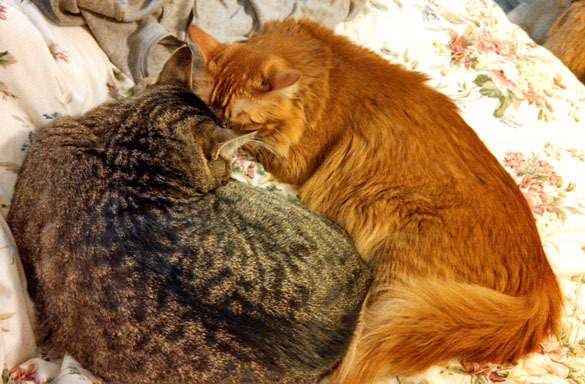 In other news, Seffie is getting along really well with my other cat, Thunder. Sometimes I’ll throw a toy, and she’ll chase it, pick it up, and bring it back to me. To a casual observer, it might appear that she’s playing Fetch, but really she just likes picking up objects and carrying them to wherever she happens to be going. She purrs all the time. I think her purr threshold is set really low (so that if you could somehow measure a cat’s happiness on a scale of 1 to 10, and most cats purr at a happiness level of 8 or higher, she probably purrs at anything over 6). She’s difficult to photograph. This morning she and Thunder were being really cute, and I tried to get some video — but I was sitting in a sunny spot, and when I picked up my phone, Seffie raced off to chase the light reflected on the wall. Oh, and if you’re wondering about what’s going on with my kitchen sink — it’s a long story. And it’s not over yet. Update: I’ve discovered that the two cats have very different approaches towards dealing with houseflies. Thunder will wait for the fly to tire itself out; he basically follows these steps: stalk stalk stalk stalk stalk stalk stalk stalk stalk stalk stalk stalk stalk stalk creep creep pounce. Seffie’s approach is more direct: zoom zoom jump zoom jump zoom zoom zoom jump zoom jump zoom zoom jump zoom jump. A Guest Post. By My Cat. It was a typical Friday afternoon — I’d spent most of the day passed out on the couch, reeking of catnip and tuna — when she walked into my life. Tessa, they called her: an orange ball of fluff with a face straight out of a Fancy Feast commercial and a purr that could wake the dead. She knew how to work a room, oozing the kind of wide-eyed innocence that reduces otherwise intelligent people into mush, wrapping them around her little finger instantly despite the fact that, technically, she has no fingers. The human and I have the standard arrangement: she provides me with room, board, and a lap to sit on; I provide her with the pleasure of my company and the occasional hairball. But leading up to that day, she’d been acting strangely — there’d been mysterious phone calls and furtive glances, and that morning, she’d set up an extra litter box in the spare bathroom and food and water dishes in the den. Tessa was no spur-of-the-moment visitor; she’d been expected. It’s been a week since she arrived. When she saw that I wasn’t taken in by her sweet innocent little kitty act, she told me a long, rambling sob story about being found under a trailer when she was three months old, then spending the next four months in a foster home, being put on display in a pet store every Sunday afternoon and passed over like a novelty ashtray at a hospital gift shop. “Listen, princess,” I told her, “we’ve all got problems. You’re seven months old. Old enough to take care of yourself. Just stay out of my way.” So she hides. And when the human finds her, she purrs. And then it starts. The human tries to coax her out. “Tessa,” she says. “Tessa Tessa. Tessa Tessa Tessa Tessa. Tessa Tessa. Tessa. Tessa Tessa Tessa Tessa Tessa. Tessa. Tessa Tessa. Tessa.” It’s like a flea gnawing at that spot you can’t reach at the back of your neck. “Tessa. Tessa Tessa Tessa Tessa. Tessa Tessa.” There’s only one way to make it stop. Desperate times call for desperate measures: we’re going to have to change her name. While I don’t agree with everything that Thunder says here, he does have a point: Tessa probably isn’t the best possible name for this cat. She’s very good at hiding, but she doesn’t mind being picked up and carried out of her hiding place. She’s been getting braver and braver; when she’s not hiding, she purrs all the time and basically acts like a kitten, playing and/or lap-sitting. So please, help me think of a better name!